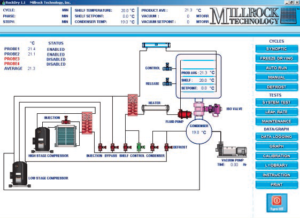 Millrock Technology’s economical STELLAR Laboratory Freeze Dryer combines many of the features of larger systems, such as the Opti-Dry® and PLC lyophilization control system, into a small package. It’s ideal for most labs, fitting a wide array of freeze drying applications from investigational laboratory work to diagnostic kits. This tray lyophilizer combines top of the line components and design techniques in addition to options such as: a manifold, capacitance manometer, hydraulic stoppering, etc. 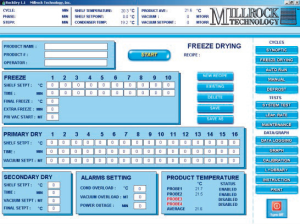 The STELLAR Laboratory Freeze Dryer from Millrock Tech is sure to fit your needs. 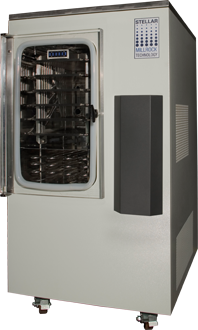 The Stellar Laboratory Freeze Dryer provides more performance and capacity than any other unit in its class. SHELF AREA 3.75 to 6.25 sq. ft. Laboratory Freeze Dryer comes complete with PLC controls and a PC for programming and data collection. Our easy-to-use software, Opti-Dry, provides automatic freeze-drying, defrost, and system test. Data can be printed either numerically or graphically. This same control system can be used on industrial dryers, allowing scaling to production. An interactive maintenance screen simplifies component servicing. uses an ethernet platform for hardware connectivity making data transmission extremely fast. It also provides web connectivity for those who want remote access to their systems.